As usual, traffic was apocalyptic on the 10 Freeway. So I cued up the Master of None episode I didn’t finish the night before, pulled out the Greek yogurt I hadn’t had time to eat for breakfast, reclined my seat way back, and relaxed. I may have even dozed off as my vehicle steered its way towards Santa Monica. 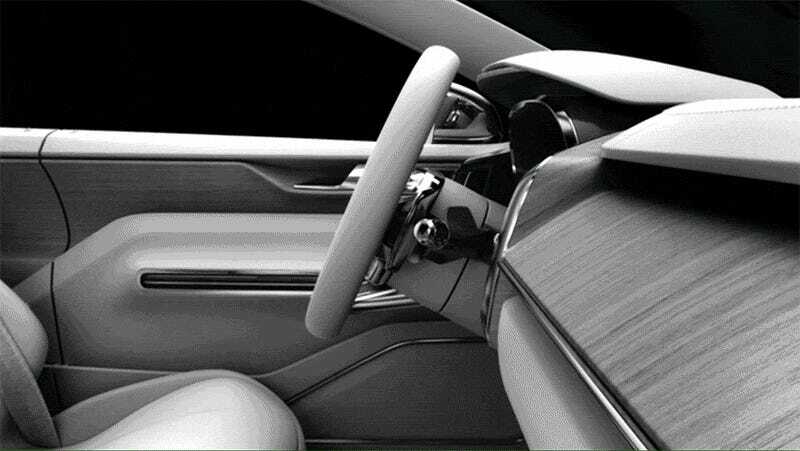 While this is the fantasy of every present-day Los Angeles driver, it’s also the proposed reality of Volvo’s new Concept 26, an “interior design concept and innovation platform” for autonomous vehicles that you can go see at the LA Auto Show this week. I spent the day at Volvo’s concept center in Camarillo, California, last week to get a look at this concept and learn how Volvo plans to subtly shift the current driving experience towards autonomy—while, at the same time, make streets safer for all. What Would You Do With 26 Minutes? Concept 26 is named for 26 minutes, the average commute time for US drivers, which Volvo sees as time that drivers could get back using this technology. This is, of course, the big utopian promise of a self-driving car—instead of focusing on driving, you use the car as a type of time machine to do some of the activities you didn’t get to at home (eating! shaving! Netflix!). As if to explicitly answer the question of what you might do with those 26 minutes, Volvo’s Concept 26 has three modes: Drive, Create (use a customized tablet touchscreen to catch up on work), and Relax (kick back and watch something on the juiced-up infotainment system). As I climbed into Volvo’s Concept 26 simulator—which was like an X-Wing fighter with Scandinavian styling—this was the part I was most concerned about: How easy would it be for a first-timer to switch modes and make that driving-to-autonomous transition? In Volvo’s future, we’ll only want to let the car do the driving some of the time—or, at least at first, cities will only allow fully autonomous navigation in certain places like on freeways, for example. The car would obviously know this and prompt you when you have the option to go autonomous (bonus: it could also route you via the most autonomous-friendly path). When it was time to remove my driving skills from the equation, I was instructed to place my hands on two levers near the steering wheel and hold them until the car confirmed the change. It’s very similar to activating cruise control except you have to use both hands. It was easy and intuitive and guided by a great graphical interface that made a lot of sense. When you’re not in Drive mode, the car transforms into more of a first-class airline seat, with a tablet-like interface at the driver’s fingertips, a tray table folding out from the door, and a 25-inch monitor that glides up into view from its stealth location beneath the dashboard. Plus the seat itself needs to change when you’re not in drive-mode, so Volvo’s come up with a cushy ergonomic reclining version of its famous seat that felt every bit as comfortable as an Eames lounge chair. Although Concept 26 is just that—a concept—and will probably take years to make its way into actual vehicles, Volvo is already embracing autonomous technology in a very serious way. Many of these features are already available on Volvo’s XC90 SUV, including Pilot Assist (which is an autopilot-like mode for stop-and-go traffic) and comprehensive collision avoidance technology. Volvo’s also developed its own autonomous technology, named Intellisafe, which is being tested on roads in Sweden right now. But perhaps the most ambitious autonomous effort—and the biggest win for safety—is the Drive Me project that will put 100 Volvo self-driving cars that are owned and operated by real people, not Volvo engineers, on the streets of Gothenburg, Sweden, in 2017. Following in the footsteps of the influential Vision Zero initiative pioneered by Sweden’s national government to eliminate all traffic deaths, the Swedish automaker unveiled its own version of the pledge—Vision 2020—which aims to eliminate vehicular deaths and serious injuries for drivers of new Volvo cars by 2020. This means diligently tracking all the fatalities that occur in its cars, something that makes Volvo unique among all carmakers. This is exactly the opposite of the situation here in the US. Although five states have approved pilot projects that allow autonomous vehicles on streets in a limited way, very few American cities are planning for this reality. The big exception is Los Angeles, which announced a Coalition of Transportation Technology yesterday, and included a statement from, yep, Volvo. But besides LA’s brand-new program, we haven’t seen any cities or states step up to work alongside these autonomous automakers—let alone a comprehensive effort from the US government. Here in the US, Volvo is talking to the National Highway Transportation Safety Administration about its ideas, but there’s an even more interesting partnership that might yield some interesting innovation: Volvo has worked closely with Apple over the last few years to seamlessly integrate Car Play into its infotainment system. This is completely my own conjecture, but I wouldn’t be surprised to see more collaboration between Apple and Volvo on the autonomous front. Of course, it’s not just autonomous technology that will make roads safer—it’s smarter cars in conjunction with better-designed streets (and ones that will need far less space devoted to the cars themselves). But there’s also a big societal change that needs to happen. Everyone at Volvo acknowledged that their biggest hurdle is the public’s embrace of taking a nap in the driver’s seat—or seeing someone else do it in the next lane on the freeway. Volvo’s Future of Driving website hopes to gather more data about people’s comfort level with self-driving technology and how they want to use the time in the car when they’re not driving, honing the experience even more with this feedback. As I rode the train back to LA, I considered Volvo’s proposal. There are obviously a bunch of technical questions that will need to be answered down the line, which I wasn’t too worried about. Like: If you do, in fact, nod off and the car needs to throw the controls back over to you, does it pull over and blast some metal to wake you up? Or: There must be some kind of external way to signify to other drivers when you’re in autonomous mode so pedestrians don’t freak out when they see you knitting in the drivers’ seat. But here’s the bigger thing. Although I’m enthusiastic about autonomous technology, this car is certainly not designed for me. It’s not for most people. The self-driving future I envision is filled with shared vehicles and zero car ownership—and Volvo, to its credit, actually acknowledged this; it is, after all, a luxury car company, so it’s going to make an autonomous luxury car. But is the future really about working our butts off to make exorbitant car payments so we can get 26 extra minutes of sleep in our robot vehicles as they shuttle us from home to office? Autonomous technology will no doubt make streets safer, and cities need to get onboard with carmakers like Volvo who can help make it happen fast. But the solution is not a Volvo Concept 26 in every garage. Just as much energy needs to be devoted to better trains and buses and sidewalks and bike lanes so people can actually get out of cars for good and enjoy their commutes. Or maybe better telecommuting capabilities—so no one has to go to an office at all. I reclined my Amtrak seat and watched the golden foothills roll towards me, glad that I wasn’t stuck in the gridlock on the freeway below, and wondering why anyone would ever choose to be, autonomous vehicle or not.